Wedding loans are a taboo topic for financial bloggers. Just looking at the numbers, most would scream at you for even considering borrowing to pay for your wedding. Of course, that doesn’t mean they didn’t borrow for exactly the same reason! While a wedding loan might not be the best financial decision you make, sometimes it’s not just about the money. That’s something a lot of ‘money experts’ forget to consider. If you think about all the things on which you spend money, most of which you won’t remember five minutes after buying. Doesn’t it make sense to spend a little more on a day you’ll always remember? Now…that doesn’t mean a budget that would make Kim Kardashian blush but you get the idea. The average wedding costs $33,391 with the venue alone accounting for half that amount according to a survey by The Knot. Half the people in the survey reported spending less than $15,000 though the average wedding cost by state was as high as $70K in New York. Next in line for biggest wedding expense is usually catering. Around $70 a person means the average wedding of 120 guests will cost $8,400 just to put food on the table. That’s a lot of very Happy Meals! If you’ve got $33,000 sitting around in your bank account…lucky you. We talked about some ideas for a small wedding and how to save in an article a few weeks ago but most people are still going to need to borrow for their wedding. That’s where a wedding loan comes in. There’s really no such thing as a Wedding Loan. What most people are talking about when they get a loan to pay for their wedding is a personal loan or an unsecured loan. This is a loan you get with no collateral, it's not secured against your home or your car. These types of loans are also called signature loans because you get them with just your signature. You can use the money for anything you like, including paying for a wedding. The downside to these types of loans is that the rate is almost always higher than a secured loan like a mortgage or car loan. 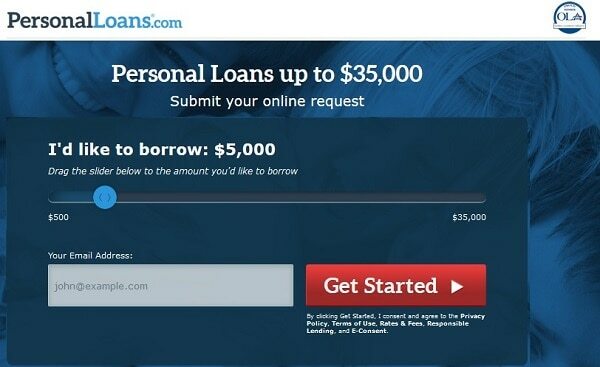 Rates range from 10% to 36% on sites like PersonalLoans.com for loans up to $35,000 on terms up to five years. Rates on wedding loans are still often lower than the interest on a credit card but can still get you in trouble if you borrow more than you can repay. The payment on a $10,000 personal loan for your wedding, at 16% and 5-year payments, would be $185 a month. Getting a personal loan to pay for your wedding takes about five minutes on most peer-to-peer lending sites. You’ll enter basic contact information, employment and salary details, and the website will check your credit score. Requirements on most lending sites are 18 years of age, household income of $2,000 or more monthly and a credit score. There are a few websites that only lend to prime credit borrowers, those with a FICO of 700 or higher, but most will loan to even bad credit borrowers. The upside to personal loans is that they are much easier and faster to get than other types of loans. Your online application is processed instantly and approval takes less than a few minutes. Most people get money transferred to their bank account within three business days. You use the money any way you like and payments usually start in one or two months. Payments on wedding loans will come directly out of your bank account but you can also make extra payments to pay off the debt faster. So I promised I wouldn’t harp on whether you should use a loan to pay for your wedding…but I just have to say something. Your wedding is important and those memories will be valuable for the rest of your life. Not everyone wants a frugal wedding and you shouldn’t be shamed into pinching pennies. Butttttttt…please just consider the trade-offs when budgeting your wedding and borrowing to pay for it. The best advice I ever got about wedding budgets was this, budget for the wedding of your dreams first as if money was not an issue. Then go back and find where you can cut without making it any less special. If you can manage to cut a third from the budget, you can feel happy about that and spend without feeling guilty. Need budgeting tips to cut your spending and afford that dream wedding? Watch this video for the budgeting tips that save me $8,000 a year! You can apply for a signature loan from most banks and credit unions, but traditional lenders aren’t usually happy about lending out for wedding loans. You’ll need a credit score well into the 700s and a good credit history. 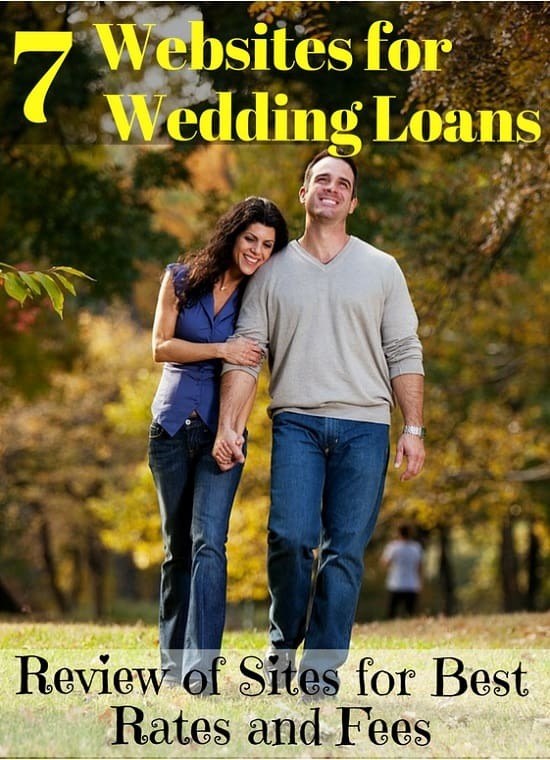 Most people will need to get their wedding loan from a peer-to-peer site or one that makes personal loans. The beauty of these sites is that you can apply to a few and pick the one that offers the best rate on your loan. Each site will do a soft-pull of your credit which doesn’t affect your credit score. You’ll be show rate quotes and monthly payments for each site before you commit to one and agree to the terms. My recommendations for wedding loan sites comes from online lenders I’ve used for personal loans, debt consolidation and home improvement projects. I’ll start with the ones I see most people use and work through the list. PersonalLoans.com is the lender I’ve used most and the most recommended among readers. I’ve used the site for debt consolidation and to remodel my home. What I like about PersonalLoans is that it’s a lending aggregator, a network of lenders that bid on your loan. This means you’ll get multiple offers from different lenders and a better chance at getting the best rate. You also get different types of loan offers including traditional bank loans, p2p loans and personal loans. NetCredit is another popular choice, especially for borrowers with bad credit. While PersonalLoans will approve borrowers with a credit score of 580 or higher (usually), I’ve seen borrowers with a FICO as low as 540 get a loan on NetCredit. The loans aren’t available in every state but it’s worth a try if you don’t get an offer on some of the other lenders. The one downside is that interest rates tend to be higher so borrow only what you need and pay it off as quickly as possible. Upstart is a unique online lending site because it doesn’t just use your FICO score for loan approval. The site uses a special computer program that includes your education and degree in the process. This makes Upstart a popular choice for wedding loans among younger borrowers that might not have much credit history but have a college degree. Lending Club is the largest peer-to-peer lender in the world and will likely be your best bet at the lowest rate. The problem here is that the site generally only approves borrowers with a FICO of 670 or higher. That can be a problem for younger borrowers trying to get a wedding loan. The average age of newlyweds is 27 for women and 29 for men. That runs face first into the problem of lower credit scores for younger people, the average score of people under 30 years old is just 630 FICO. What are Other Ways to Pay for My Wedding? While a personal loan may be your best bet at paying for your wedding, there are some other ideas you might want to consider. A Home Equity Line of Credit (HELOC) is like a credit card you take out against the value of your home. You bank will approve you to borrow up to a certain limit based on an appraisal of your home. You can borrow as much as you need and only pay interest on the amount borrowed. The advantage of a HELOC to pay for you wedding is that rates tend to be lower because the debt is secured by your home. You’ll need a lot of equity in your home to borrow even $10,000 – in fact, you’ll probably need to have been paying on your mortgage for many years to have that kind of money saved up. HELOC loans often have variable rates which mean your rate and payment will go up as interest rates rise. If you can’t make your payments, you face losing your home. I love that you can save money on lower rates with a HELOC, but the disadvantages make it a dangerous way to pay for your wedding. Of course, using a credit card to pay for your wedding is also an option. The advantage here is that you don’t have to pay an origination fee which is usually around 1% to 5% of your loan amount from most online lenders. You might also get cash back or reward points for money you spend on the card. The downside to using a credit card to pay for a wedding…well, where do we start? Rates are usually higher than personal loans and just one late payment will mean a rate reset to the highest allowed in your state. You’ll pay an extra fee for cash advances on your card, some services are charged as a cash advance instead of a purchase. Credit card debt is categorized as revolving debt on your credit report so will lower your FICO score more than other types of debt. Looking at the average cost of a wedding, it’s obvious that the biggest costs come in just a few expenses. 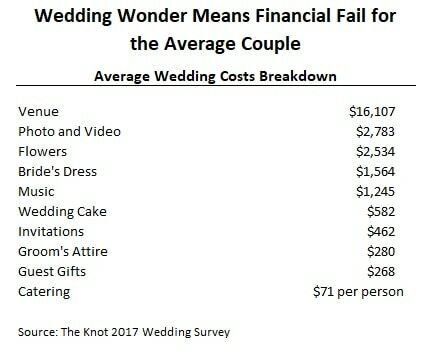 The venue and catering can easily come to 80% of the cost of your wedding but I’ve also heard of brides with $10,000+ dresses that broke the bank. Can you finance the wedding dress or one particular part of the wedding? Sometimes a plan of only getting a loan for a small part and paying cash for the rest can give you the discipline to save and cut expenses to lower the cost. Focus on the biggest expenses first if you’re looking for places to budget. Finding a way to cut half off your venue costs will save thousands and make a lot of room for other wedding costs. Probably the best alternative to pay for a wedding is to get creative about how you pay for it. We covered some of these ideas in our list of small wedding ideas, but I’ll repeat a few of my favorite here. Ask guests to help with the wedding instead of a gift. Ask a few friends to bring food or help manage the dinner. Saving even half that $71 per person average for catering can save thousands. Have a destination wedding away from home. This will cut your wedding list down a lot and saves on many of the other expenses. Have a dinner later for guests that couldn’t make it. Ask your guests to take pictures and videos with their phones. It amazes me how much people pay for wedding photography despite the fact that everyone now has a mini-film studio in their pocket. The four personal loan sites above are a good place to find wedding loans, but I thought I would add a few more and categorize the websites for different needs. Again, it’s important to check out at least a few sites to make sure you’re getting the best deal available. Applying on several sites at once will not affect your credit score and you’ll save money in the long-run. A few websites specialize in loans to borrowers with bad credit though the credit score cutoff will vary. 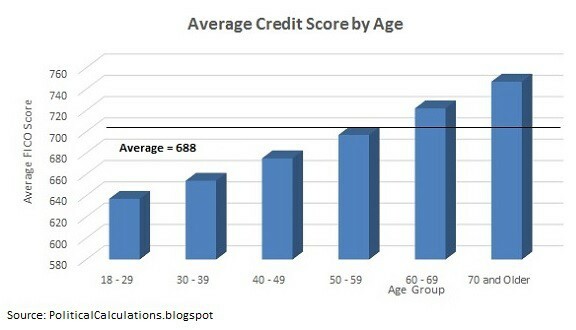 Generally, anyone with a FICO below 670 (which includes one-in-three Americans) will fall into this range. NetCredit is one of my favorite sites for personal loans because there’s no origination fee. This can easily save you over $1,000 even on a smaller loan. Rates vary by state and the site will usually approve borrowers as low as 520 FICO. PersonalLoans.com is hands-down the most popular among readers and I’ve used the site a few times myself. There is an origination fee but rates tend to be lower even for bad credit loans so it evens out. I’ve seen borrowers with a credit score as low as 580 get a loan on the site and you can use the money for any purpose. BadCreditLoans specializes in the worst of credit scores though loans are usually capped at a $5,000 limit. The website is a network of lenders so you benefit from shopping your loan around to get a better rate. The fact that most people get married fairly young means credit is usually a huge roadblock in getting a wedding loan. Even if you’ve been taking care of your credit, you probably don’t have much credit history to get a loan. Upstart is one of the fastest growing loan sites because of its unique loan approval program. The lender will look at other factors besides your credit history, making it easier for borrowers with no credit to get a loan. If you have a college degree, this is definitely one you want to check out. Payoff specializes in credit card consolidation but you can also get a wedding loan from the site. The website is completely transparent with its fees, which is always a good start, and rates are competitive with others. Most borrowers will need a credit score of about 660 and lower than 50% debt-to-income ratio. Rates on personal loans tend to be higher than other types of loans. That could make your dream wedding even more expensive, even if loan rates are still cheaper than charging it on a credit card. If you have a higher credit score, you might consider some of the loan sites here that specialize in good-credit borrowers. Lending Club is a massive p2p lender with investors that invest directly in loans. In fact, I invest my money on the site. Rates start around 6% which is about as low as you’re going to find among online lenders though you’ll need a FICO score of 670 or higher for approval. SoFi started out as a student loan refinancing site but has since expanded into mortgages, car loans and personal loans. The site doesn’t release its minimum credit score for loan approval, but I’ve heard it is comparatively high. Still, fees and rates are lower so it’s worth a try on the potential to save a few grand. Applying for a wedding loan is actually the easy part. It takes less than a couple of minutes to fill out the pre-approval application on most peer-to-peer sites and less than a minute to get approved. The website will check your credit and estimate a rate on your loan. It will also tell you how much monthly payments are going to be. This next part is critical! Make sure you shop your loan around to a few sites to compare rates and always make sure the monthly payment is within your budget. You don’t want to start your marriage off with debts you can’t cover. Once you get approved and accept the rate, you’ll sign your documents online and the money is usually deposited in your bank account within a day or two. The biggest delay for most personal loans is verification documents. Loan sites only ask about one-in-ten borrowers to verify their information with pay stubs or other documents but it’s best to have them ready just in case. Once your money is deposited, you can use it for whatever you like including paying for wedding expenses. Your loan statement will say when you’ll start repaying the loan but it’s usually about 30 days after you get the money. I’ve tried to take both sides in the pro and con of wedding loans, or just loans in general. I’ve never bought into the belief that all debt is bad, only how you use it. I want you to be responsible with your debt but to also have it available. This is something that only happens once and you’ll remember for the rest of your life. A wedding loan can help make it a little more than what it could have been otherwise. Interest rates are at historic lows which means payments are generally affordable for most loans. Personal loans aren’t secured by collateral so you don’t have to worry about losing your house or car if you miss a payment. It’s easy to overspend when you have more money available. Set a strict budget before you know how much you’ll have to spend. 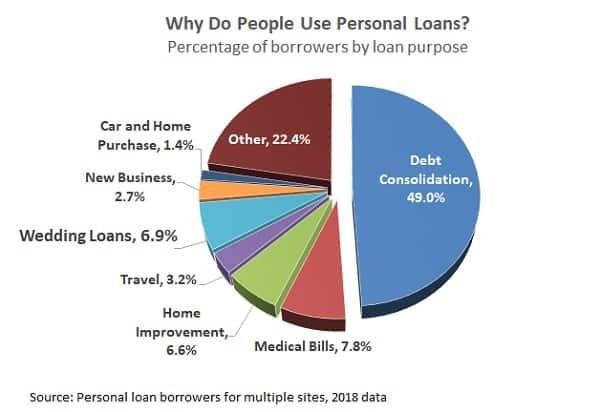 Personal loans can come at higher rates than mortgages and car loans. That means higher payments on your wedding loan. Debt can cause a lot of stress if you’re not able to deal with it. That’s something you don’t need when starting out a marriage so make sure the monthly payments are within your budget. How much you should spend on your wedding is always going to be controversial and getting a wedding loan, even more controversial. If you do decide to find a lender for a wedding loan, make sure you shop around for the best rate possible and only borrow as much as you need. Consider some unique ideas to cut expenses and pay off your wedding loan as quickly as possible.